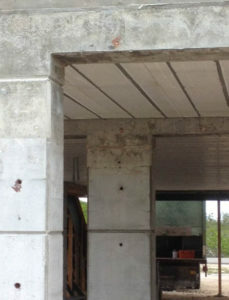 In the Keys, newer construction is using concrete rather than wood pilings or columns. The concrete specification for a house in a high salt climate can have additional additives to prevent spalling. Other additives can aid the concrete pour by making the mix slippery, to insure all areas inside the ICF blocks are filled. 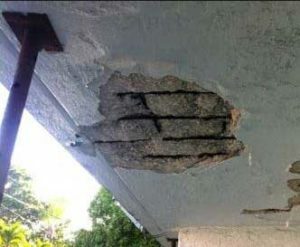 Fixing areas of visual concrete corrosion (spalling) is an good-sized industry in the Florida Keys. One person I talked with said that the concrete needs to have binders to make sure the concrete sets within the form. Concrete should be in a “honey” consistency to fill all crevasses, corners, bucks and rebar. Marine concrete in the atmospheric zone is above the splash zone and subject to occasional seawater spray. Low permeability helps keep aggressive chemicals out of the concrete, slows leaching of soluble materials such as lime, and limits the depth of carbonation, better protecting reinforcing steel from corrosion. Any design and construction measures that reduce permeability will improve durability. The limestone aggregate forms a stronger chemical bond with the cement paste and has a thermal coefficient of expansion closer to that of the cement paste. Because of these factors, they believe limestone aggregates provide a more durable concrete product in a marine environment. The main purpose of using super-plasticizers is to produce flowing concrete with a high slump in the range of seven to nine inches to be used in heavily reinforced structures and in placements where adequate consolidation by vibration cannot be readily achieved. 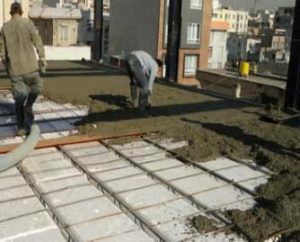 The other major application of super-plasticizer is that it improves the workability of concrete. Corrosion-inhibiting admixtures fall into the specialty admixture category and are used to slow corrosion of reinforcing steel in concrete. Corrosion inhibitors can significantly reduce maintenance costs of reinforced concrete structures throughout a typical service life of 30 – 40 years. Corrosion-inhibiting admixtures have little effect on strength at later ages but may accelerate early strength development. Calcium nitrite based corrosion inhibitors do accelerate the setting times of concrete. Cracks, spalls, mortar erosion, and corrosion stains are visible signs of deterioration that causes increased porosity and decreased strength. ACI 357, however, recommends a minimum cement content of 600 pounds per cubic yard (pcy). Also, to protect reinforcing and pre-stressing steel from corrosion, no calcium chloride or admixtures containing added chloride should be used. The limestone aggregates, commonly found in south Florida, forms a stronger chemical bond with the cement paste and has a thermal coefficient of expansion closer to that of the cement paste. Because of these factors, they believe limestone aggregates provide a more durable concrete product in a marine environment. The next step up in preventing concrete spalling, cracks and leaks is the introduction of GGBS (ground granulated blast-furnace slag). It is a by product of iron smelting. To protect against chloride attack, GGBS is used at a replacement level of 50% in concrete. Instances of chloride attack occur in reinforced concrete in marine environments. The use of GGBS in such instances will increase the life of the structure by up to 50% had only Portland cement been used, and eliminates the need for more expensive stainless steel reinforcing. Types II and V concrete are designed to be resistant to sulfate attack common to marine environments. Sulfate attack is an important phenomenon that can cause severe damage to concrete structures. This type of concrete is used in concrete construction that is exposed to alkali soil and ground water sulfates which react with (C3A) causing expansion and cracking. It is a chemical reaction between the hydration products of C3A and sulfate ions that enter the concrete from the outside environment. These cement types II and V have a very low (C3A) composition which accounts for its high sulfate resistance. The expansion reaction has a larger volume than the reactants, and this creates stresses which force the concrete to expand and crack. As with type IV, type V Portland cement has mainly been supplanted by the use of ordinary cement with added ground granulated blast furnace slag or blended cements containing slag and fly ash. 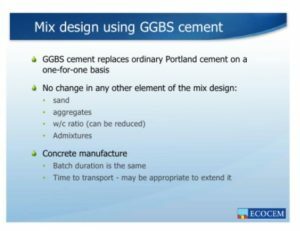 Concrete containing GGBS cement has a higher ultimate strength than concrete made with Portland cement. It has a higher proportion of the strength-enhancing calcium silicate hydrates (CSH) than concrete made with Portland cement only, and a reduced content of free lime, which does not contribute to concrete strength. 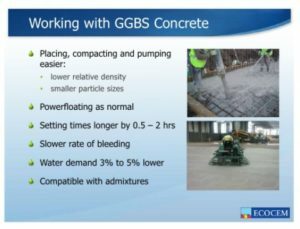 Concrete made with GGBS continues to gain strength over time, and has been shown to double its 28-day strength over periods of 10 to 12 years. This concrete mix has a slower setting time than traditional concrete mixes. The mix is more viscus and filling of crevices is thought to be better. I don’t know of the availability of the GGBS additive in south Florida or it’s cost. If most of the work there is what has always been done, I don’t know if anyone knows how to mix or work with it. Since GGBS is a by-product of steel manufacturing process, its use in concrete is recognized by LEED etc. as improving the sustainability of the project and will therefore add points towards LEED certification. One other thing you can look at.